pie subject needs to be gradually balanced wise distributed .hope to remember all sir. sweet regards to all aboard ISS.from U.K. with love. I am Gareth Jones in Lowestoft , Suffolk in the U.K. I love the blog and please keep us all up to date and I take my hat off to you ALL in space !! Wow! Who knew! Thanks for sharing! Thanks for the post. I wrote about it for Examiner . I think you bring Space Exploration to life. I saw the ISS twice within the past two weeks and it was a fun but short experience! It’s cool to read about what goes on up there! Thanks from us here at we found this post really interesting. Thanks again! thank you don for the comments from space , i enjoy your comments. hope to hear a few more before you return !! I’m an ex submariner from the other side of the pond. I found that the sooner I’d got myself into a routine at sea the easier things became (time wise). After a while it was possible to shave those tedious time consuming duties down to their bare minimum to enable enjoyment of the more interesting aspects of life under the ocean wave. I would imagine the easiest thing to fore go would be the exercise routine. That has to be tedious in the extreme and yet one of the most important to undertake. Do you get nagged by your controllers much if you miss a routine or are things so regimented that you do them to keep them off your back. Is one of you in charge up there to make sure the others are sticking to their routines? Have fun and enjoy. I’m an amateur astronomer and I know exactly what part of the station I’d be at any given time…is there a queue for the cupola? Don Petit is amazing at conveying the experience in space.. He easily one of my top 5 fav Astronauts. (those tend to change often). Thanks for Sharing Don! This is a piece of art! Thanks Don! 1. A new coffee machine and an “espresso” whith Georges Clooney. 2. To sip all sorts of teas of the world, eat bonbons an also to eat your favourite hamburger with fried ships. 3. To have lots of free week-ends to look at your feet or just to look at the grass growing. 4. A bath in a spring in the middle of a forest. Surrounded by a luxurious nature : roses, birds and other little animals. I work at KSC and after watching the latest installment of “This Week at NASA” about the anniversary of the first launching of the shuttle to MIR and the returning of Russian cosmonauts in the shuttle, I was wondering if you have landed in the Soyus capsule and, if so, what the biggest difference is between that and landing in the shuttle and which you perfer, ie: spaciousness, bumpiness, thrills, etc.? 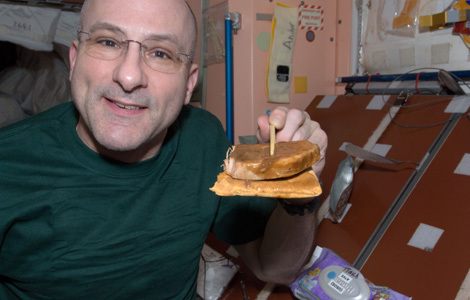 This is a wonderfully well written and complete description of life aboard the ISS. Thank you, Don, for your well scripted prose. My only regret is that I couldn’t find your entry about avoiding exercise, which is hinted at elsewhere, but all of the links to it are broken, and a search yields nothing that resembles the description. If someone who maintains the website could find it and restore it to accessibility, that would be much appreciated. Thanks.